Once again thousands of protesters have poured into streets of Tabriz and Urmia in Iran's Azerbaijan region on Saturday to call on the Iranian government to save the dying Urmia Lake, one of the world's largest salt water lakes. Iranian authorities quickly reacted by repressing protesters. The news was censored in Iran-based media, but several video were posted on YouTube and bloggers flooded cyber world with their posts. Blogger Urmuiscierli writes [fa] that there were battles on the streets with security forces beating up and arresting protesters, and even tying them to trees. Some bloggers called on more Iranians to support the Azeri activists and relaunch anti-regime demonstrations around country. 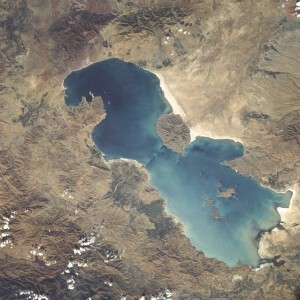 The construction of a dam on part of the lake, accompanied by a recent drought has significantly decreased the annual amount of water Urmia receives. This in turn has increased the salinity, repelling many birds and threatening permanent damage to the ecosystem. If the lake dries out, millions of people in the region will need to resettle to survive. In Urmia, people say the lake is dying and that the authorities are responsible. Azarakan writes [fa] that the spark started in Azerbaijan, and that we should now support their struggle and do what we can to stop regime forces repressing Azeri people. He says, this is a rare opportunity and that we should go on until freedom. 1freecountry writes [fa] that Urmia Lake does not distinguish between Tehran and Tabriz, we should organize in coming days everywhere. Revolutionary Guards are responsible for constructing such dams to make a lot of profit. We should be aware of the cyber army of the Revolutionary Guards. In such occasions they post and share links to divide Iranians. Doughodushab calls on [fa] Iranians to defend Urmia Lake and Azerbaijan. The blogger writes that we are all trapped by the Islamic regime and should protect our natural and cultural heritage. Andarbab suggests [fa] that this Tuesday in Tehran and other cities people protest and demonstrate for supporting Azerbaijan. Use of force always to silence people’s dissent could be very dangerous as has been seen in erstwhile communist states (perished) only decades ago, Arab spring still work on progress… Fail to understand why these Rulers / Govs. don’t seem to realize. It’s in the interest of Iran to gradually change attitude towards their own people now, rather than waiting for the Typhoon which will unnecessary entail maybe..destruction of property, lives …. Expect more unrest related to Urmu-Lake in the coming day,particularly 03-Sept-11 in most cities of South-Azerbaijan!! Clash in Azerbaijani cities of Tabriz, Urmia, and Ahar in Northwest of Iran after Iranian parliament reject to allocate budget to save Lake Urmia. Hundreds of Azerbaijanis in Iran demonstrated at 6.15 pm on Saturday, September-03-2011 in Tabriz and Urmia after the Azerbaijani environmental activists’ call for protesting to demand the Iranian parliament to save Lake Urmia. Demonstrators chanted in Turkish “Urmu Gölü can verir – Məclis onun qətlinə fərman verir” means “Parliament orders death to Lake Urmia”, “Urmu Gölü Susuzdur” meaning “Lake Urmia is thirsty”. The Riot police occupied the cities after the call and tried to disperse the people. The Clash between protesters and riot police started in Rasta Alley in Tabriz and Attai St. in Urmia. The Zanjir Sq and Samadazadeh Street in Urmia were the places of civil fight between environmental protesters and police. The police imprisoned the women and children in shopping malls in Tabriz by enforcing the people to go inside the shopping malls and closing the doors. Basijis without uniforms have fired the Bazaar and broken the windows. According to the Ogrenji reporters in Tarbriz and Urmia cities about 40 and 20 persons have been arrested, respectively. A few injuries have been reported. -This is not just an environmental protest but continuation of the Azeri national movement to end Persian racism,colonialism and stablishing South Azerbajan state. -Azeris make up 25% to 43% of Iran ’s population (according to CIA and UN estimates). They are concentrated in their historic region of South Azerbaijan (northwestern Iran ). Politically they resisted Pahlavis since 1920 and Ayatollahs since 1980. They formed a strong Azeri movement and rallied for democracy and their ethnic rights. For decades, ethnic and cultural discrimination is the official policy of the Shah and mullah regime in Iran , where Azeris are treated as second class citizens by virtue of limitations and even complete lack and absence of education in native language; and constant harassment and discrimination from central authorities designed to culturally and linguistically assimilate the ethnic Azeris. -Today, Azeri people are Iran ’s largest ethnic minority and their resistance movement is the most powerful opposition group to the theocratic, authoritarian and terrorist regime of Persian mullahs. To achieve any changes in Iran , ethnic Azeris’ role is most crucial, and cannot be ignored, as the Azeri movement has the best shot to tackle the Iranian regime from within. This can happen with the help of the freedom loving people of the West and world.End.